Photograph collection of webmaster. 25286 (later 25905) date & location unknown. The twenty year ten month career of D7636/25286/25905 included allocations to Eastern Region & London Midland Region depots, with a particular bias to the north-west area depots. Built: Beyer Peacock Gorton Ltd, Works No.8046. Angled strip at bottom of cab doors (1978). Time between last Classified repair and withdrawal: 95 months. January 1970 to Preston Division (D10). May 1971 to Liverpool Divison (D08). August 19th 1986 to unserviceable store. Renumbered into TOPS April 20th 1974. Renumbered to 25905 November 25th 1985. 25905 was the 293rd Class 25 withdtawn, one of seven retired during September 1986, including shedmates 25907, 25909 & 25911. After withdrawal 25905 was stored at Kingmoor. On July 14th 1988 25905 was moved to Upperby depot for inspection but then returned to Kingmoor. Another visit was made to Upperby on November 10th 1988, prior to moving to Mossend Yard by November 25th 1988 (with 45044/51/70 picking up 25325 & 25905) and to BRML Glasgow Works the next day for component recovery. During October 1989 25905 moved into MC Metal Processing's yard. By the middle of February 1990 25905 was no more. Noted Derby Works September & October 1972 (collision damage). Noted Crewe Works May 1974. Noted Derby Works June 1976. Noted Derby Works December 1977 - March 1978. Noted Glasgow Works August & September 1979 (general repair). The first recorded passenger workings for D7636/25286 involve the summer dated roundtrip Sheffield - Llandudno Town service, D7636 worked the services on July 29th 1967 and on August 26th 1967, on the latter date with 7634. On August 3rd services north of Crewe were seriously disrupted when 7636 & 7635 became derailed near Winsford station after running through catch points whilst hauling the 6M55 15.22 West Thurrock - Corkickle freight (eight 100 ton empty tanks). An overhead gantry was hit, the lead locomotive nearly falling into a country lane. The crew fortunately escaped with only minor injuries. 7636 was moved to Derby Locomotive Works for repairs. On December 15th 1972 the 13.50 Derby - St. Pancras was worked from Derby to Leicester by 134 & 7636, possibly a Works running-in turn for the Class 25. On June 30th 1973 7636 & 7612 worked a Leicester - Yarmouth service. In the early hours of June 6th whilst waiting on the slow lines with a coal train at Nuneaton station 25286 witnessed the high speed derailment of the 5th’s 23.30 Euston – Glasgow sleeper service. The two electric locomotives, 86006 & 86242 became parted, with the latter causing considerable damage to itself and the station, bringing down several gantries that caused minor damage to the Class 25. All the coaches were derailed, with damage being heaviest at the front of the train, tragically six lives were lost. By the evening of 6th the Bescot, Crewe & Saltley cranes were present alongside other engineering trains, in the hands of 24074, 47034 and three Class 25s. Six coaches, (five sleepers and a BG) were broken up on site. By the 11th engineering/rewiring trains were still present including 24074 and 25193, the latter having been on-site since the day of the accident. Two days later only 24058 was on hand with an engineers train. The damage sustained by 25286 required Works attention, the gantry/mast hit the No.2 cab, driver's side, damaging the cabroof, headcode box and the driver's side cab front. The No.1 cab sustained minor damaged to the headcode box. On July 8th 1978 25286 & 25268 worked the Derby - Norwich - Yarmouth - Norwich - Walsall passenger diagram. 25286 spent two days, September 27th & 28th stranded at Reading depot awaiting the arrival of an LMR driver to take the locomotive home. 25286 was noted at Bletchley on April 12th. Looking northbound, Springs Branch allocated 25286 drops down across Great Rocks Junction to deliver another load of empties on April 24th 1979. Behind the locomotive lies an area previously used by the steam locomotives that once powered these stone workings. The 11.05 Manchester Victoria - Holyhead was worked by 25286 on June 22nd & July 7th. On July 4th the 05.34 Holyhead - Trafford Park freightliner was worked by 25286 instead of the more normal Class 40. A day excursion on July 16th from Coventry to Blaenau Ffestiniog was worked from Crewe to Llandudno Junction by 25286 & 25270. The Nottingham - Llandudno Town on July 21st was worked forward from Derby, returning throughout to Nottingham. On September 30th 25286 was north of the border working the 04.20 Mossend Yard - Glasgow Queen Street forward from Cowlairs Junction, being the portion off the 1S07 Euston - Inverness, followed on the next day (October 1st) with 21.50 Euston - Fort William again between Cowlairs Junction and Glasgow Queen Street. A roundtrip relief Nottingham - Skegness was worked by 25286 & 25269 on May 26th. The 14.00 Glasgow Central - Carlisle was worked by 25286 on August 19th. On June 20th 25286 & 25032 worked the 08.35 Derby - Yarmouth to Norwich and the 14.20 Yarmouth - Derby from Norwich. The next day (21st) the same pair worked a Leicester - Skegness roundtrip. Photograph courtesy Roger Geach collection. 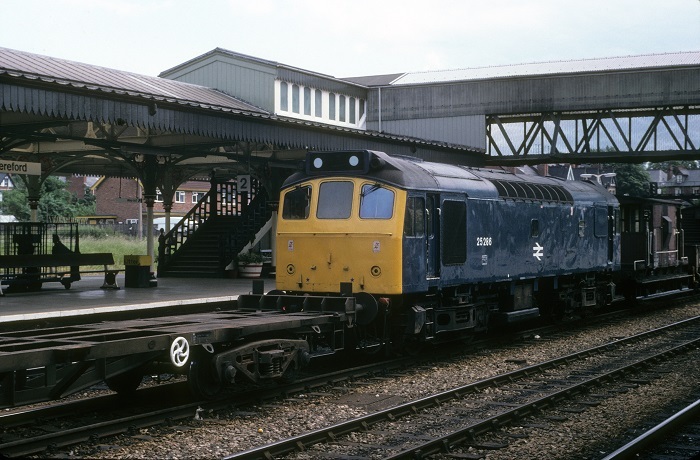 25286 at Hereford on June 29th 1981. 25286 was noted at Buxton depot on July 18th. The relief (?) 10.50 Barrow - Lancaster and a return Lancaster - Barrow were worked on August 22nd by 25286 (may have been August 15th?). On October 10th a Bolton - Stratford-on-Avon day excursion was worked by 25286 & 25032 throughout(?). On this date 25286 is also recorded as working an Edinburgh - Blackpool North day excursion forward from Preston. On March 5th the 18.05 Euston - Blackpool North was worked from Preston by 25286. On July 27th 25315 & 25286, worked the bitumen loaded tanks o Cranmore from Ellesmere Port. 25286 & 25315 were stabled at Birkenhead Mollington Street on August 1st and were later noted southbound at Crewe with a UKF fertiliser train. The 15.12 Manchester Piccadilly - Harwich Parkeston Quay on November 2nd was noted arriving at Peterborough having worked from Manchester or Sheffield? 25286 with brakevan was noted at Banbury on November 17th. On February 8th the Ditton - Broughton Lane BOC tanks and return was worked by 25286 & 40181. Sisters 25286 & 25285 worked the 00.30 Manchester Piccadilly - Euston forward from Rugby on August 7th due to engineering works. 25286 was stabled at Longsight on August 27th. A diesel multiple unit failure on September 18th saw 25286 working the 08.35 Northwich - Manchester Piccadilly. 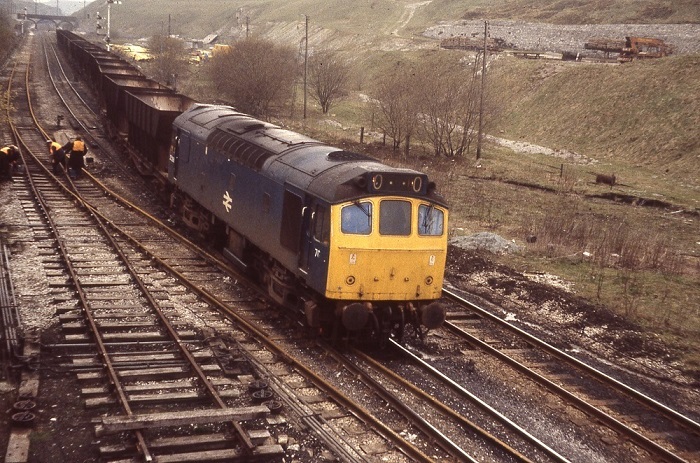 25286 was noted at Low Gill on April 14th with a train of short wheelbase ICI? tanks. The failure of a Class 33 on a Cardiff - Crewe service on July 15th (?) saw 25286 drag the service to Crewe (from Hereford?). 25286 was noted with a northbound freight at Garstang on July 20th. 25285 & 25286 were stabled at Motherwell depot on August 28th. On August 31st 25285 & 25286 worked an afternoon Llanwern – Dee Marsh steel coils working. On September 1st 1984 the 10.10 Euston - Aberystwyth got into trouble with 25178 & 25192, these were replaced at Forden by sisters 25285 & 25286 which after reversing to Welshpool worked only to Machynlleth where the service was terminated due to late running. At Machynlleth the train was turned around to become the 17.38 Machynlleth - Shrewsbury. 25286 was noted at Warrington Arpley on November 29th. 45076 & 37042 & 25286 were noted light engines at Bescot station on December 19th. 25286 was noted running light engine by Saltley on December 31st. 1985 produced quite a crop of workings for 25286. When the Class 45/1 working the 11.14 Bangor - Newcastle failed at Warrington on January 19th 25286 took the service to Manchester Victoria. A month later on February 21st the diesel multiple unit working the 15.06 Preston - Leeds (via Copy Pit) failed before departure, 25286 worked the train to Leeds. A 01.30 Crewe - Stoke-on-Trent relief was worked by 25286 on April 21st. 25286 was stabled at Severn Tunnel Junction on June 23rd. 25286 worked the 6S75 12.55 Severn Tunnel Junction - Mossend being noted at Cwmbran on June 24th, also on this date 25286 was noted at Hereford goods yard with a load of lumber awaiting unloading for road transfer to the Pontrilas sawmills, 25286 was still present on June 27th. On June 28th (or 14th) 1985 the 18.15 Cardiff - Manchester Piccadilly with 45046 swapped power with 25286 scheduled to work a heavy freight, but the Class 25 was low on power and given the easier task from Hereford to Crewe Gresty Lane. 25286 was stabled at Crewe on July 7th. 'The Silver Hammer' railtour on August 3rd from Euston to Maxwelltown was worked roundtrip between Carlisle & Maxwelltown by 25286 & 25200. Later that day 25286 worked the 17.40 Carlisle - Glasgow Central. Two days later (Aug 5th) 25286 & 25315 worked the relief 10.41 Exeter St. Davids - Edinburgh forward from Carstairs. This same service was also worked on August 19th by 25286 & 25296. 25286 & 25296 were noted on the up oil empties at Machynlleth on August 14th. The remaining passenger workings for 25286 during 1985 were all on the Scottish Region. On August 31st 25286 worked the 08.40 Carlisle - Glasgow Central, the 13.45 Glasgow Central - Carlisle (with 37226) and the 17.40 Carlisle - Glasgow Central. A roundtrip over the Edinburgh - Carstairs route took place on October 15th, working the 14.00 Carstairs - Edinburgh (portion off the 07.47 Cardiff - Glasgow) and the 18.10 Edinburgh - Carstairs (portion for the 18.10 Glasgow - Manchester). On October 16th 25286 arrived at Newcastle hauling a failed diesel multiple unit on the 15.45 ex Carlisle service. 25283 & 25286 were noted northbound at Crewe with a train of sand on October 21st. During November 25286 was transferred to Kingmoor and renumbered to 25905. 25905 was noted at Tunnel Cement, Penyffordd on December 5th. 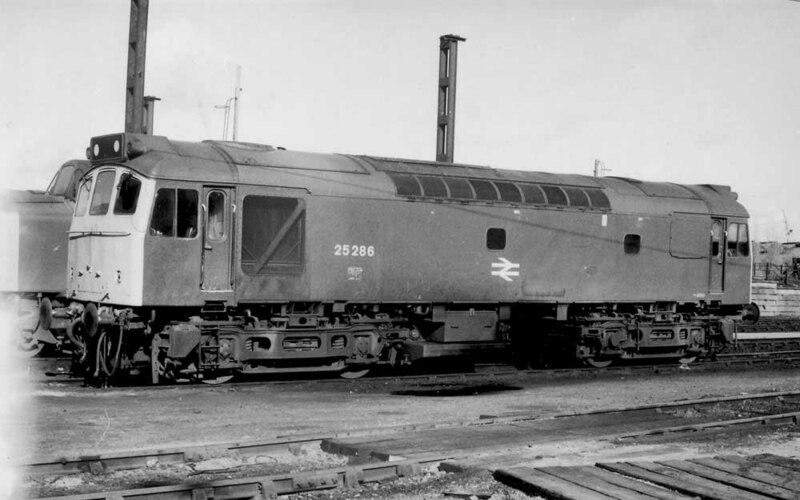 25905 was receiving attention at Crewe depot on April 27th, having had its bogies removed. The last two recorded passenger workings for 25286/25905 were very short. On May 11th engineering work between Liverpool Lime Street & Edge Hill saw the 16.40 Liverpool - Poole and 17.46 Liverpool - Brighton dragged by 25905. 25905 was stabled at Chester depot on June 8th. On July 3rd 25905 & 25906 worked a Dee Marsh Yard - Chester Yard via Watery Road (Wrexham) Speedlink freight. 25908 & 25905 were noted eastbound at Chester on July 23rd with cement tanks. 25909 & 25905 were noted at Chester on July 29th eastbound with a freight. 25905 & 25902 were noted northbound (?) at Warrington Bank Quay on August 3rd with mineral/coal wagons. No.1 cab front: 2nd man's side corner: minor damage to corner valencing, slightly bent under: August 1983 until withdrawn. The cab panels with number, allocation sticker and TOPS panel escaped scrapping. Page added September 17th 2013.